A woman has seen her own heart on display at a medical exhibition. Jennifer Sutton, 23, from Ringwood, Hampshire, successfully underwent an operation to replace her heart earlier this year. She had developed a life-threatening condition called restrictive cardiomyopathy in her teens. 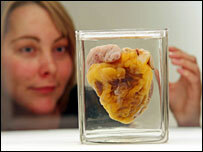 Now the original heart, which nearly killed her, has been put on temporary display by the Wellcome Collection in central London. The exhibition explores the medical and cultural significance of the heart. Jennifer decided to lend her heart to the Collection after undergoing surgery at Papworth Hospital, Cambridge, in June. She hopes to help increase public awareness about organ donation - and the disease that could have ended her life. She said: "Seeing my heart for the first time is an emotional and surreal experience. "It caused me so much pain and turmoil when it was inside me. Seeing it sitting here is extremely bizarre and very strange. "Finally I can see this odd looking lump of muscle that has given me so much upset." Restrictive cardiomyopathy causes the heart muscle to stiffen so the heart cannot relax normally after contraction. As the disease progresses, the heart muscle continues to stiffen and eventually contraction is also affected. The disease eventually causes death and a transplant is the only cure.